I do not deny that what is judged “top” in these reviews may tell the reader more about us than it does about the world of biblical archaeology. These lists are entirely subjective, and since they are based on what we decided to post (and not to ignore), they are doubly subjective. The primary criteria for selection was that the story was posted on this blog and then it caught my eye when I reviewed the year’s stories. The lists follow a roughly chronological order. The ancient church, built over the traditional site of Jesus' birth in Bethlehem, is shared by three Christian denominations: Roman Catholics, Armenians and Greek Orthodox. Wednesday's fight erupted between Greek and Armenian clergy, with both sides accusing each other of encroaching on parts of the church to which they lay claim. The full story is here. A video of the scene is posted online here. Word is now out that the Rose Guide to the Temple is nearing publication. I could tell you how great it is, but you might as well see for yourself (see preview at bottom of page). If they sold stock for books, I’d certainly invest in this one. I predict it will be a best-seller and an award-winner. Amazon is taking pre-orders for $30 with a February 21 publication date. Amazon also lists three glowing endorsements. The publisher’s website indicates that you can also purchase the book for pdf download, which would make it much easier for use in the classroom. Professors may request a desk copy. Earlier this year Eisenbrauns published a collection of essays in honor of David Ussishkin, The Fire Signals of Lachish: Studies in the Archaeology and History of Israel in the Late Bronze Age, Iron Age, and Persian Period in Honor of David Ussishkin. The book gets its name from Lachish Letter #4 in which the writer is looking for some indication that Lachish has not fallen to the Babylonians. David Ussishkin was a long-time professor at Tel Aviv University and his noteworthy excavations include the Silwan tombs in Jerusalem (1968-71), Lachish (1973-94), Tel Jezreel (1990-96), and Megiddo (1992-present). The book is now available from Eisenbrauns, and you can get more details, including a complete listing of the contents, here (pdf). The cover photo is one that I provided from the American Colony and Eric Matson Collection, volume 3. Over the years I’ve mentioned the excavation at the “back” of the Western Wall prayer plaza. The latest issue of Biblical Archaeology Review has a report by the excavators on their discoveries at the site from 2005 to 2010. Since I expect some curious student to ask me in a couple of days about the big hole in the ground, the article arrived at a good time for me. I made a few notes as I read the article that I thought I’d share here. The earliest remains at this spot indicate that it was used as an Iron Age quarry. Later in the Iron Age, a four-room house was constructed here. This was a Jerusalemite’s home sometime after Hezekiah fortified the Western Hill with a new wall (part of which is known today as the “Broad Wall.”) The house may have been destroyed by the Babylonian assault in 586, but this is not certain. Several personal seals were found in the building, including one depicting an Assyrian-style archer. Curiously, there is no evidence of occupation at the site in the Babylonian, Persian, or Hasmonean periods (586-50 BC). In the New Testament period, the Lower Aqueduct ran through this area, bringing water from “Solomon’s Pools” to the Temple Mount. The only other discovery from the 1st century was a ritual bath (mikveh). The most impressive remains at the site are that of a monumental street. This cardo is similar in size and design to its counterpart to the west, located today in the heart of the Jewish Quarter, but the archaeologists say that the eastern cardo was constructed in the Roman period by Hadrian (whereas the southern extension of the western was built by Justinian c. 530). All the details are presented in a much more interesting style in the January/February 2012 issue of Biblical Archaeology Review. The article, with all of its illustrations, is currently available online, no subscription required. The process of wet-sifting debris from excavations below Robinson’s Arch on the southwestern corner of the Temple Mount has revealed a 1st-century seal impression inscribed with “pure for the Lord.” Scholars believe that this mark was used to certify offerings as acceptable for temple use. The Aramaic inscription is about 3/4 of an inch (2 cm) in diameter and has six letters. To the best of our knowledge, this is the first time that such an object or anything similar to it was discovered in an archaeological excavation and it constitutes direct archaeological evidence of the activity on the Temple Mount and the workings of the Temple during the Second Temple period. The full press release includes more details from the Mishnah about ritual tokens. The Israel Antiquities Authority has also released five high-resolution photos of this and related discoveries (zip file). The Jerusalem Post has a three-minute video interview with Ronny Reich. The article’s statement that the inscription was found near the Pool of Siloam contradicts the official report of the IAA that the object was found next to the Temple Mount. The story is also reported by the AP, Reuters, and Arutz-7. Wayne Stiles’ weekly column provides the best and most concise review of the significance of Bethlehem that I have read. You might bookmark this one for future lessons or sermons. Yoni Cohen investigates some sites in Israel related to the festival of Hanukkah. One of 107 cuneiform texts recently published depicts the great king Nebuchadnezzar. Oded Borowski reviews Eilat Mazar’s new book Discovering the Solomonic Wall in Jerusalem: A Remarkable Archaeological Adventure. Did the Magi give Jesus frankincense and myrrh because they cure arthritis? Travelujah has the full run-down of Christmas services in Bethlehem and Jerusalem. A retired professor, preaching tomorrow about Bethlehem in north Texas, has been to Israel 69 times. The Star-Telegram tells his story. Vandals attacked and heavily damaged an Antiquities Authority site near Afula overnight Wednesday, destroying findings dating back to the First Temple era. “All the signs” pointed to a group of haredi activists as the main suspects, due to their opposition to what they describe as the desecration of graves, Dror Barshad, an archeologist for the authority’s northern district, told The Jerusalem Post. The same group vandalized a second archeological site near the Kinneret last month, he said. The full story and photos are here. The Hebrew version of the Ynet article includes a photo of the site before the destruction. A report of the 2008 excavations and a photo of a Late Bronze tomb was published last month in Hadashot Arkheologiyot. Last week I linked to Bryant Wood’s article on new evidence for Israel’s existence in 1400 BC. According to three European scholars, an inscription mentions Israel several hundred years earlier than the Merneptah Stele. There are several ways to respond to this proposal. James Hoffmeier, an advocate of the late-date exodus (1230 BC), says that the inscription should not be read as Israel and thus is irrelevant to the question of the exodus. In an article published in the January/February 2012 issue of Biblical Archaeology Review (HT: G. M. Grena and Shmuel Browns), Hershel Shanks summarizes the recent studies and concludes with a discussion about multiple departures from Egypt by Israelite tribes at different times. Earlier advocates of such include Albrecht Alt, Yohanan Aharoni, and Abraham Malamat. Such an approach is wrong-headed, I believe. In the first place, it can only be reconciled with the biblical account by considering the latter to be only an elaborate and glorious myth created hundreds of years later (and peppered liberally with shameful acts of those who devised the myth). Second, such an approach replaces one exodus for which there is no record in Egyptian sources with many exoduses for which there are no record in Egyptian sources. A better approach is to take a step back and reconsider the issue afresh. The reason why scholars argued for a 13th century BC date for the exodus/conquest in the first place was because of an apparent lack of evidence for Israel in Canaan at an earlier time. The Merneptah Stele, paired with the appearance of hundreds of agricultural villages in the 12th century, has been considered to provide evidence for the earliest Israelites. This evidence does not, however, tell us anything about Israel’s entrance into the land. It tells us only when Israel was already in the land (and defeated by Egypt). Last year I showed how the Merneptah Stele gives evidence for Israel’s invisible (to archaeologists) presence in the land of Canaan for some time before they settled down in the hill country villages. The recently published inscription, if the reading of Israel is accurate, provides even earlier evidence for the nation’s existence. As with the Merneptah Stele it does not tell us anything about the exodus or the conquest. To theorize that there were multiple exoduses when these inscriptions provide evidence for none is the wrong course indeed. The best historical reconstruction takes into account all of the evidence. Israel fled from Egypt in about 1450 BC. They arrived in Israel in about 1400 BC. They continued their pastoral way of life that they were used to from the time of the patriarchs, their time in Egypt, and their time in the wilderness. This lifestyle left relatively little discernible and distinctive archaeological evidence from 1400-1200 BC. Some factors (weather?, political turmoil?, invasions?) forced the Israelite tribes to settle down at the beginning of what archaeologists call the Iron Age. This corresponds well with the record in the book of Judges in which the first indication of a settled existence is mentioned in the time of Gideon, who led the nation in about 1200. A Byzantine-period bathhouse has been discovered near Moshav Tarum north of Beth Shemesh. A cuneiform inscription discovered in the Tas-Silg sanctuary on Malta is now the westernmost such inscription known. Haaretz reports on an archaeologist who believes he is close to finding the true tombs of the Maccabees. Preston Sprinkle asks if Jesus was born at an inn and if he was a carpenter. Leon Mauldin shares some photos of the traditional site of Jesus’ birth in Bethlehem and of a stone manger possibly similar to one used for the newborn. Ferrell Jenkins links to some previous posts about the birth of Jesus and Christmas. Aren Maeir’s idea of a Hanukkah/Christmas gift is to share one letter from an inscription found at Gath. The Bible and Interpretation is sharing one of my favorite photos of Jerusalem today (click on the thumbnail for large version). The Daily Mail publishes an illustrated account of one visitor’s five-day visit to Jordan and its main attraction, Petra. The Jerusalem Post suggests 10 things to do over Christmas in the Holy Land. For the first time ever, live-size nativity scenes will be set up in Bethlehem and Jerusalem. Item 9 explains how you can celebrate Christmas three times this season. If one studies the history of scientific research in the Middle East, one begins with Napoleon’s invasion of Egypt in 1798. Though most famous for the discovery of the Rosetta Stone, the campaign included a team of draftsmen and scholars who studied and recorded the land’s temples and tombs. The publication of their study awakened Europe to the treasures of the ancient past and spawned modern Egyptology and biblical archaeology. The original manuscript of Napoleon’s Description de l’Egypt has been kept in Cairo at the Institute for the Advancement of Scientific Research. In an attack by protestors on Saturday, 166,000 works were reportedly destroyed including the Napoleonic work. The story is reported by Ahram Online, Haaretz, and others. If only the manuscript had been displayed (or stored) at the British Museum or the Pergamum Museum, this loss would have been avoided. If you’re interested in the beautiful drawings from the French campaign, a new edition published in 1987 made the work much more accessible to the public. A nice two-volume box set with all 421 plates from the original edition was published by Princeton Architectural Press. I had the happy opportunity to pick up Monuments of Egypt: The Napoleonic Edition some years ago, and I see that Amazon still has a few copies available. If you are looking for unique Christmas images, the Accordance Blog tells you where to find them. A scroll containing the Ten Commandments from Deuteronomy has just been put on display at Discovery Times Square in New York City. Iraq’s second largest museum is paying smugglers to return the artifacts. If you’ve been intrigued by the title of Jodi Magness’ latest work, BAR has posted a review by Shaye J. D. Cohen of Stone and Dung, Oil and Spit: Jewish Daily Life in the Time of Jesus. The book is available for $16 at Amazon or $20 at Eisenbrauns. A bulla with the name of a biblical town has been discovered in the Temple Mount Sifting Project. According to ANE-2, Gabriel Barkay will present it at a conference at Bar Ilan University at the end of the month. The new Egyptian Minister of Antiquities has announced new policies for his department. Fishermen using illegal nets in the Sea of Galilee have been caught and detained. The Biblical Archaeology Society has released a new edition of its free eBook, The Dead Sea Scrolls: Discovery and Meaning. The new material looks at the War Scroll, the Temple Scroll, and the Book of Enoch. If you have not already, you must register to receive the eBook. Olive Tree Bible Software now has the ESV Bible Atlas for sale for $22, the Zondervan Atlas of the Bible for $26, and the Holman Bible Atlas for $20. These atlases are supported on the Android, iPad, iPhone, Mac, and soon the PC. If you ever hear the name Ron Wyatt in connection with some amazing archaeological discovery, run the other way. His death in 1999 did not prevent his frauds from being perpetuated in email forwards and on various websites. His alleged discovery of chariot wheels in the Red Sea and research claimed to date the objects based on the number of spokes is worthy of being featured as the latest post at PaleoBabble. Over at biblearchaeology.org, Bryant Wood presents some new evidence for the existence of Israel in an Egyptian inscription dating to about 1400 BC. The first two names are easily read—Ashkelon and Canaan. The name on the right, however, is less certain. Görg restored the right name as Israel and dated the inscription to the reign of Ramesses II (ca. 1279–1212 BC) in the Nineteenth Dynasty, based on a similarity of names to those on the Merenptah Stela (ca. 1210 BC).1 Görg also concluded, based on the spellings of the names, that they were copied from an earlier inscription from around the time of Amenhotep II (ca. 1453–1419). Israeli Egyptologist Raphael Giveon (1916–1985) previously dated the inscription to the reign of Amenhotep III (ca. 1386–1349 BC) (1981: 137). If these two scholars are right, this extra-Biblical Egyptian inscription would place Israel in Canaan at about the time of the Biblical date for the Conquest. Wood then goes on to describe the results of a new published study by three European scholars who confirm this reading. He also notes an objection by James Hoffmeier. Wood and Hoffmeier have previously debated the date of the exodus and conquest in a series of articles in the Journal of the Evangelical Theological Society. A conference will be held at Ben-Gurion University in the Negev (Beersheba) on January 19th, 2012. Entitled “‘In the Shadow of the Olive Trees’ - Olive Trees, Olive Oil and Their Products,” the conference is being organized by the Southern District of the Israel Antiquities Authority and the Department of Bible, Archaeology and Near Eastern Studies of the Ben-Gurion University in the Negev. This announcement was circulated on the Agade list. Presumably all lectures are in Hebrew. For more information, contact the sponsors. 9.30-11.00 First session. The olive and the production of olive oil. Chairman: Dr. Gideon Avni. 11.15-12.30. Second session. The olive press and the products of the olive oil. Chairman: Prof. Steve Rosen. Dr. Akiva London. Did olive tree nurseries exist during the Roman and Byzantine periods in the land of Israel? 13.30-14.30. Third session. Panel and general discussion. Prof. Nili Liphschitz, Dr. Eitan Ayalon, Dr. Yigal Israel. 14.45-16.00. Archaeological news in the southern district. Chairman: Dr. Peter Fabian. Dr. Hayim Goldfus. The excavations at Horbat Zalit. On Sunday the Mughrabi bridge was closed. Hamas called the closure a “declaration of religious war.” The mayor of Jerusalem called the bridge “ugly and dangerous.” Today the bridge was re-opened with a fire truck standing by. Gordon Franz has written an detailed guide to the “Dead Sea Scrolls: Life and Faith in Biblical Times” exhibit in New York City. He has made it available for free on his blog. The Jerusalem Post has a story and video about the solid gold menorah on display in the Jewish Quarter. One government committee approved the construction of a hotel complex in the Timna Valley, but an Israeli cabinet minister has vowed to stop it. It could take 100 years to restore Israel’s rivers, according to the State Comptroller. The report looks at 31 of the country’s major rivers and streams. The Herodium reminds Wayne Stiles of the Christmas story that never appears on Christmas cards. Antiquities thieves plundering a second-century site near Shaar HaGai (Bab el-Wad) have been arrested. The ASOR Blog has links to news in the broader world of archaeology. The latest issue of DigSight is online. The Megiddo Expedition is recruiting volunteers for the 2012 excavation. MEXICO CITY – City authorities have set up a nativity scene -- certified by Guinness Records as the largest in the world -- as part of their Christmas festivities. The nativity scene, which cost $2 million to create, sprawls across the parking lot of the giant Azteca stadium. The scene, which covers 215,000 square feet -- larger than four football fields, has 5,000 figures portraying 57 biblical passages related to the birth of Jesus in Bethlehem. Organizers said that it took architects, engineers, designers and historians 70 days to create the project, which was unveiled by Mayor Marcelo Ebrard on Wednesday, 17 days before Christmas. The full story and a photo is here. NTD has a two-minute video news report. They expect more than one million visitors in the next month. Some of our Christmas-related posts from previous years may be of interest to readers who were not with us then or who may enjoy a review. 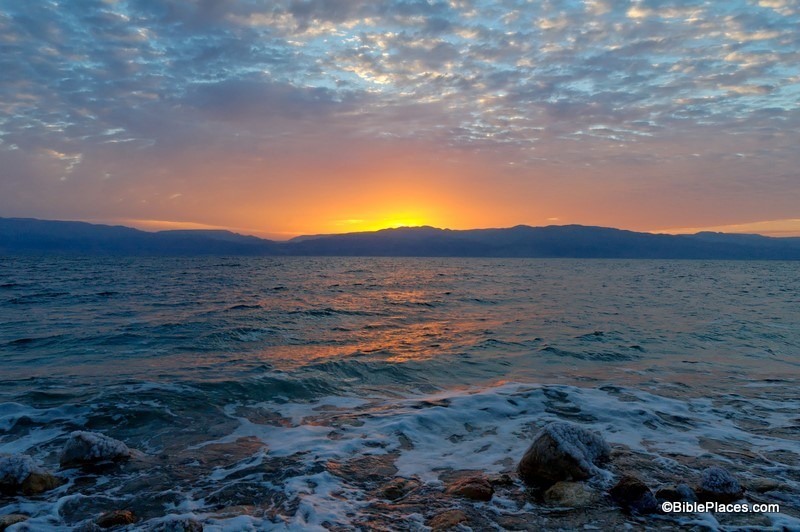 A new study suggests that the Dead Sea nearly dried up in the ancient past. As of December 1, the water level of the Dead Sea was 1,361 feet (425.36 m) below sea level. The Sea of Galilee is still 27 inches (69 cm) below the red line. Will Varner has posted a PowerPoint presentation of the Messianic Hope of the Hebrew Scriptures. He utilizes a number of our Christmas-related photos and welcomes readers to use the presentation as they wish. A 3.8 magnitude earthquake was felt in the Galilee earlier this week. A medical doctor in western Galilee has been arrested for leading a ring of antiquities thieves. One group is unhappy with Israel’s plans to develop a national park east of the Mount of Olives. Leen Ritmeyer has a roundup of recent stories of Jerusalem in the news. Wayne Stiles expected to be disappointed by his visit to Nazareth Village. Shmuel Browns explains why hiking is a national pastime in Israel. He gives his recommendations on the best hikes. Leon Mauldin shares a video of a potter fashioning vessels on the island of Rhodes. The concrete of ancient Rome is weaker than the modern version, but it lasts longer. One of the secret ingredients was volcanic ash. $12 will get you a beautiful 2012 calendar of the Lands of the Bible. Focal Question: How significantly and in what ways did the Temple and its cult help define the social and spiritual life of early Jews, including Jesus and his earliest followers? Purpose: To correct the popular impression that Jesus despised the Temple and its cult because he attacked the money changers and was apparently condemned by the leading high priests [the historicity of each event must be discussed]. To raise questions which are focused on pre-70 Jews, Jesus, his followers and the Temple and to seek a new consensus on the grid questions. An extension of the symposium is being held on Dec 18-19 in Miami Beach, Florida. Though I have serious misgivings about the stated purpose of the symposium, I would certainly attend if I was able. Full details are here. An RSVP is requested. Last week, Ir David Foundation head archeologist Eli Shukron told reporters he was so puzzled by the shapes – three V’s about 50 cm. long and 5 cm. deep – that he couldn’t begin to guess their function. The figures were found in a room near a spring, an important ritual area for the ancient city. But Shukron’s bewilderment hasn’t stopped people around the world from offering their conjectures. Among the most interesting ideas: a torture device, drainage for ancient urinals, the original McDonald’s sign, an abbreviation for “veni vidi vici” (Latin for “I came, I saw, I conquered”), a footprint from King Solomon’s pet dinosaur, molds for smelting iron to make tools, the Trinity, a representation of mountains or the symbol for water, signs to the exit, an alien cryptogram, or support for a wooden structure. The marks remind me of preparation to cut a board. If these engravings are directly above Hezekiah’s Tunnel (and I don’t know that they are), I’d surmise that the outer arrows mark the edges of the cutting and the middle one marks the center point. The full story is here. You can read the 20,000 comments and make your own here. Jerusalem municipality officials stressed that the wooden bridge poses a severe security threat since it is highly flammable and in danger of collapsing. They warned that if a fire breaks out it could spread to the Temple Mount. I can’t help but thinking that this is a political move, not primarily an issue of safety. The bridge has been made of wood since it was constructed and did not become “highly flammable” yesterday. As for a fire spreading to the Temple Mount, the doors at the gate might burn, but everything else in the area is made of stone. In other words, there seem to be other reasons for this urgent order. Of course, is there anything in Jerusalem that is not political? Yet the news reports make no such suggestion, so it seems worth pointing out to those less familiar with the situation. Sept. 2000 – Muslims close access to Temple Mount and its shrines to all non-Muslims. Aug. 20, 2003 – Israel re-opens the Temple Mount to tourists over Muslim objections (photos here). Shrines remained closed. Feb. 14, 2004 – The earthen ramp to the Mughrabi Gate collapses after a snowstorm (photos here). Mar. 2005 - A wooden bridge is constructed to permit access to the Temple Mount. Jan. 2007 – Excavations begin on the earthen ramp (photos here). Muslims protest after being told by their leaders that the Temple Mount is being undermined. Israelis halt the excavation in June. Mar. 2011 – Construction of a new bridge is authorized by an Israeli judge. June 2011 – Israel delays construction of a new bridge until September. Oct. 2011 – Jerusalem’s city engineer orders that the Mughrabi bridge be repaired or closed. Nov. 2011 – Prime Minister Netanyahu orders that closure of the ramp be postponed. This review excludes other relevant events, including the opening of the Western Wall tunnel, the illegal excavations on the Temple Mount, the resultant bulges on the southern and eastern walls, and the continuing political impact of these events. Today’s story is reported by the Jerusalem Post and Haaretz. An aerial photo with the relevant sites labeled is posted here. Israeli diggers who uncovered a complex of rooms carved into the bedrock in the oldest section of the city recently found the markings: Three "V'' shapes cut next to each other into the limestone floor of one of the rooms, about 2 inches (5 centimeters) deep and 50 centimeters long. There were no finds to offer any clues pointing to the identity of who made them or what purpose they served. The continuation of the story gives more information about the “V” found by Parker, the unique nature of the room, the standing stone found nearby, and a couple of nice photos. The City of David Facebook page is asking readers who have seen anything similar elsewhere in the world to share their knowledge. We noted last week the inauguration of the “Gospel Trail,” a 40-mile route that runs from Nazareth to Capernaum. Tom Powers has noted an article in Haaretz that discusses the need for a $700,000 expenditure to create a trail with essentially the same purpose and route as one established several years ago. All well and good, but a brief perusal of the map of Israel reveals that another route was dedicated three years ago and goes by a few names, among them the "Jesus Trail." It follows a slightly different route, 65 kilometers in length, with orange trail markings, from Nazareth to Lake Kinneret, and caters - until recently, with the enthusiastic encouragement of the Tourism Ministry - to exactly the same clientele. The creation of the older route began as an initiative of Maoz Yinon, a 35-year-old entrepreneur who owns the Fauzi Azar hostel in Nazareth, plus another hostel in Jerusalem. At the time Yinon won the support of many groups for his plan, among them the Tourism Ministry, the Israel Trails Committee (part of the Society for the Protection of Nature in Israel ) and several local authorities. Together with an American Christian named David Landis, he developed a route based on three principles: It would have a connection to Christian tradition, it would feature hiking in beautiful landscapes and it would encourage the involvement of local communities. and the places visited are not truly representative of Galilee’s diverse social fabric – more specifically, it steers the trail users away from Arab towns and villages in favor of Jewish areas. I’m sure that the Israeli Ministry of Tourism will have a different perspective to justify their expenditure of 3 million shekels. A new visitor’s center has apparently opened in Jaffa (biblical Joppa). “We built new galleries, we opened a new visitors’ center. We tell the stories of the history of the city from the time of the Bible, the Ottoman and Roman Empires, and the Egyptians in Jaffa.” The report includes a two-minute video. A large statue of Amenhotep III has been discovered at the pharaoh’s mortuary temple in Luxor. A compromise was approved by a district court last Thursday between Adam Teva V’Din – Israel Union for Environmental Defense and vacation village developers, that will allow for guaranteed public access to the beaches and infrastructure developed at a Kinneret beach on the Golan Heights, both sides confirmed on Tuesday. Along with local residents, Adam Teva V’Din had filed a petition arguing that the Kursi resort project should not be allowed to go forward without public access to the beach and open areas. The parties eventually reached a compromise, allowing for the continued construction of the village, but with an officially mandated agreement that will allow for public access to the beach and surrounding nature spots. In addition, the developers will be responsible for building a public parking lot and a promenade that connects with the existing path that surrounds Lake Kinneret, according to Adam Teva V’Din. The full story is here. According to the best NT manuscript evidence, no pigs died at Kursi. The site of the swine dive should be located in the territory of the Gadara on the lake’s southeastern shore. Last month Eisenbrauns released a new book that looks fantastic. Unearthing Jerusalem: 150 Years of Archaeological Research in the Holy City has a rich collection of articles authored by those who know the subjects best [with one glaring exception]. I have not read the book, and will not be able to for several months, but I know that some of the readers here will want to get this on their Christmas list. The Eisenbrauns website has the publication details, but more helpful than the two-paragraph description is the table of contents. I’ve re-formatted that below for easier reading. It should be noted that the book is based on a conference held in 2006 and thus those looking for the latest results from excavations will want to check elsewhere. Doron Ben-Ami and Yana Tchekhanovets, Has the Adiabene Royal Family “Palace” Been Found in the City of David? One last comment: the natural choice for the presentation/article on Iron Age Jerusalem is Gabriel Barkay. He knows the city and this period far better than Israel Finkelstein and he does not suffer from the biases that make the latter’s work unreliable. Perhaps a logistical reason made Barkay’s participation impossible.